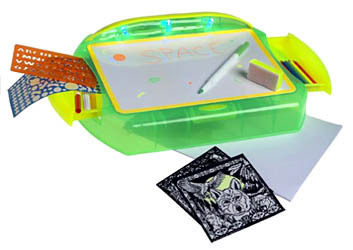 Create cool magic glowing drawings with this special desk. Draw on the dry erase surface or paper with fluorescent markers and colored pencils. Then turn on the black light and watch your drawings glow. Also, use the invisible ink marker to write secret messages that can only be seen under the black light. Pure magic.